Accurately and transparently remove pops, clicks and crackle using three discrete sections. Each has a threshold and sensitivity control to define the number of events that are detected and removed. The unique Events Graph shows the level and duration of each pop, click and crackle as it’s detected in three separate colour-coded groups. Sometimes there will be events detected that represent audio we want to keep rather than remove. So we built the Exclude Box to further refine the number of repaired events, and also Dialogue Mode for independent control over speech in programme. 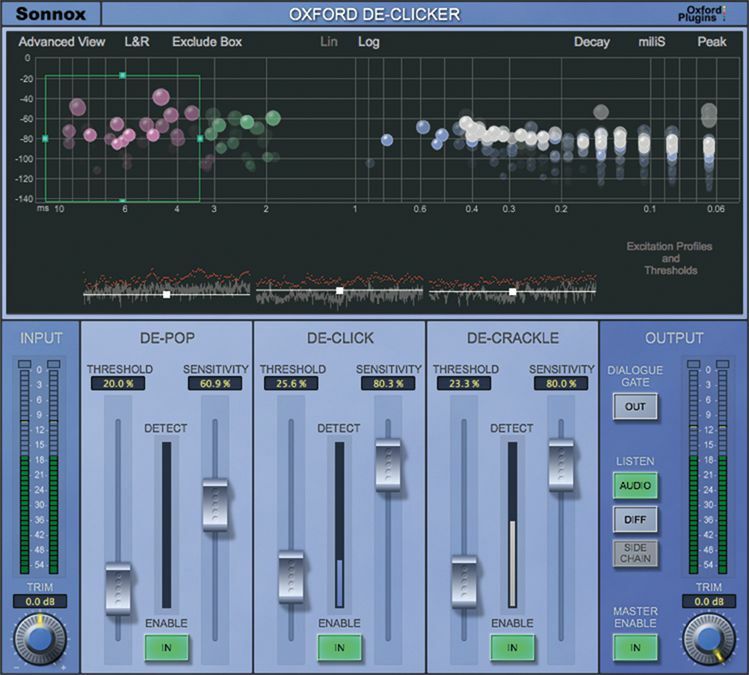 The Oxford DeClicker does not support Avid’s TDM/HDX hardware DSP platform. This includes Venue, S3L and S6L systems. The Oxford DeClicker is also available in the following money-saving bundles.